Improve the comfort of the herd through summer! We supply quality evaporative misting systems throughout New Zealand. Smartkool Misting Fans make any space comfortable to live, work and play! Misting systems and misting fans allow for more comfortable temperatures through effective dispersion of fine water droplets into the hot air. We specifically custom fit your requirements and site needs. 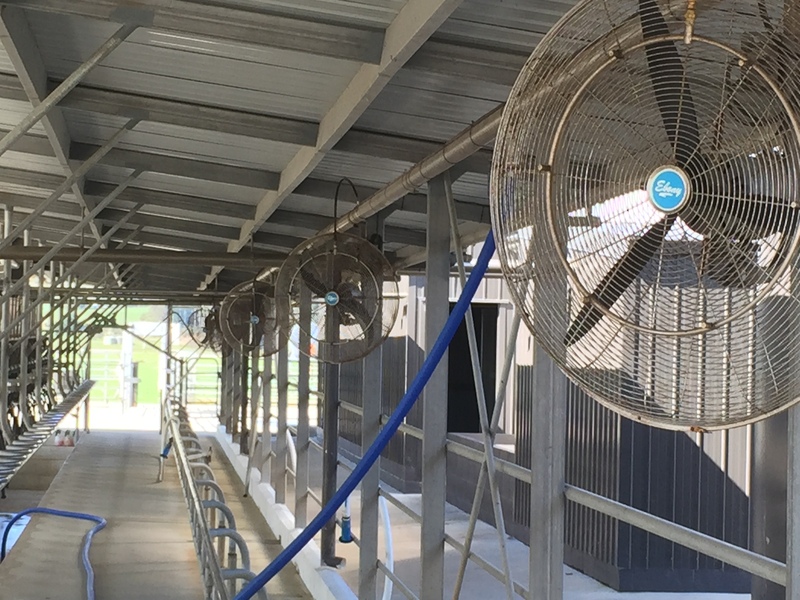 Call the experienced team at Smartkool Misting Fans for the ultimate cooling solution for your dairy shed, horse stable, gym, warehouse, industrial business or outdoor living space. Outdoor and indoor comfort are only a phone call away! We utilize the highest quality components; our dedication to quality sets our company and product apart from the competition. All of our high-pressure misting units are heavy duty, industrial grade rated and come come with a CE certification. Reduce Insects such as flies and mosquitoes! Smartkool is cheaper than air conditioning and more affordable to run. Happier, more comfortable cows in the dairy shed will produce more milk solids. Misting systems and misting fans use a process known as evaporative cooling. Evaporative cooling lowers ambient temperatures as water evaporates upon the flow or passage of air. Misting systems work by pumping water through tubing with attached small nozzles that release the pressurised water in microscopic droplets. The mist is so fine; the water droplets evaporate almost instantly. As a result of this immediate evaporation process, it is possible to dramatically reduce the temperature of outside areas by as much as 10 degrees, often in seconds. Misting pumps can be low pressure, medium pressure or high pressure. Usually, misting nozzles are made from stainless steel or brass. The orifice at the end of a misting nozzle is very narrow, usually just a few micrometers, and produces a very fine micro-mist of water droplets. This is where the “magic” of misting takes place. Today, misting systems and misting fans are used in an impressive array of locations and settings. Misting is used in both residential and commercial locations.Misting is used in both residential and commercial locations. Talk to us today about how our misting solutions can benefit you.